Armed groups are intrinsic to conflict. Pursuing myriad aims, they shape and are shaped by the conflict landscape. UN missions too inhabit this landscape. They too must decide how best to pursue their goals of supporting early peacebuilding and so-called stabilisation. This book argues that the UN is peacekeeping in places where there is no peace to keep. A profoundly confused UN has failed to develop the instruments to adequately identify armed groups, and then deal with the challenge they pose. This book is a policy guide for UN missions. It contemplates the challenging nature of non-permissive UN mission environments and offers a challenge to the UN to think afresh about the way it undertakes missions in these settings. 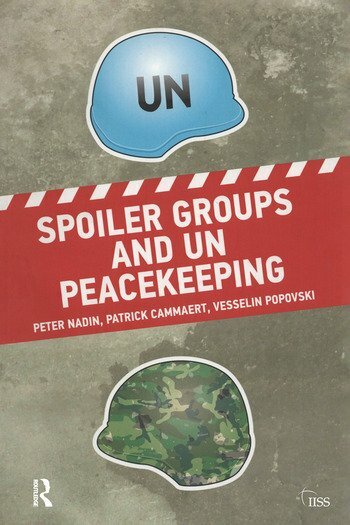 The book appropriates several underdeveloped concepts – robust peacekeeping, political processes, and the protection of civilians – and uses them to ignite the conversation on a UN stabilisation doctrine. Peter Nadin is an independent researcher based in Sydney, Australia. He has worked previously at the United Nations University in Tokyo. His research interests include the UN Security Council and UN Peacekeeping Operations. Peter holds a PhD from the University of Western Sydney. Major General (ret’d) Patrick Cammaert has served with distinction as a senior commander in UN Peacekeeping Operations [in the Congo (MONUC), Ethiopia-Eritrea (UNMEE), Bosnia (UNPROFOR) and Cambodia (UNTAC)], and as military adviser at UN HQ. He is an expert advocate on leadership, conflict related sexual violence and peace operations. In 2008 he was awarded the Carnegie-Wateler Peace Prize. Professor Vesselin Popovski is Vice Dean of the Law School and Executive Director of the Centre for UN Studies at Jindal Global University, India. From 2004-2014 he worked as Senior Academic Officer at the United Nations University in Tokyo.